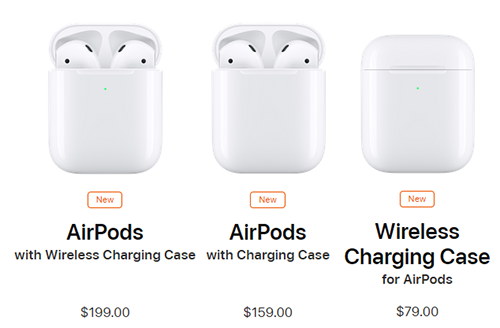 The new version of the Apple headphones AirPods 2 and up officially – full details and price! Finally after waiting for long as long as revealed Apple about the new version of the headset, its wireless Apple AirPods 2 which comes improvements multiple as shipping wireless activate Siri voice and other new things that we highlighted in this article. Come headphones Apple AirPods 2 its so-called new Apple H1 custom headphones wireless, and mission work of the wireless connection is fast and stable with different hardware. Thanks to this wizard, the user can activate the Siri voice across the heavens as soon as you say “Hi Siri” it also ensures that the processor get to experience high-quality voice, if you listen to the voice of your favorite or playing games or listening to a video. Containing the heavens at the expense of working with some automatically improve the experience of the sound and once you put it in your ear, and speech recognition, issued by you with the assistance of the microphones, which filter the sound of your voice and isolate it from external noise. Headphones are available in white only. The battery in the headphones Apple AirPods 2 allows calls to up to 3 hours compared to two hours in the past version. Other than that, all indicators that the battery is still as IS since you can get 5 hours of listening through it in one shipment, thanks to the cargo tray, the battery can last up to 24 hours through shipping additional to that provided by the heavens. Supports headphones Apple AirPods 2 Fast shipping – as the previous – just charge it for 15 minutes will give you up to 3 hours of listening time or two hours of making calls. As you know shipping rate from a connected device or via Siri. There is also a box shipping standard and supportive people wireless. If you are a developer and publish your apps via the news app to reach for a large segment of Arab users to reason across the following mail: info@arabapps.org will your app soon in the list of news apps if level befitting the user. Do you want more apps and news? Apple unveils headphones Powerbeats Pro Wireless – an alternative to headphones AirPods !